What's in our Sweet and Sour Eggs. 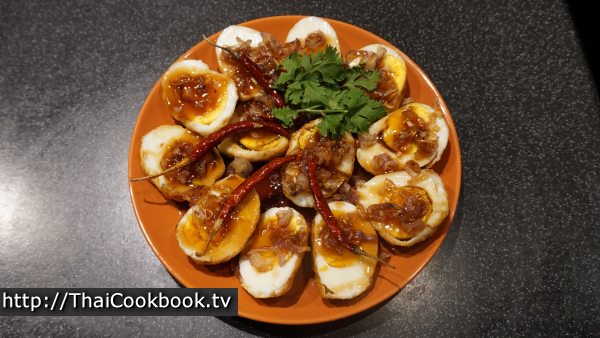 How we make our Sweet and Sour Eggs. 1) Boil and peel the eggs. 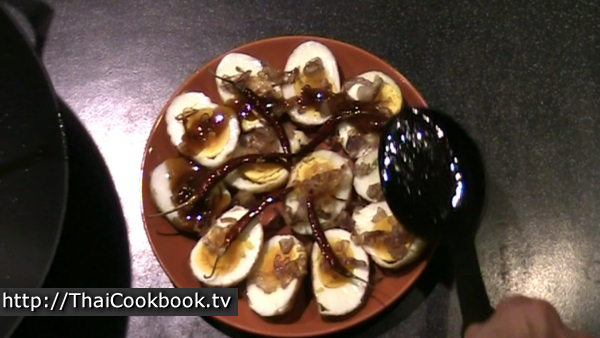 2) Fry the peeled boiled eggs in oil until brown. 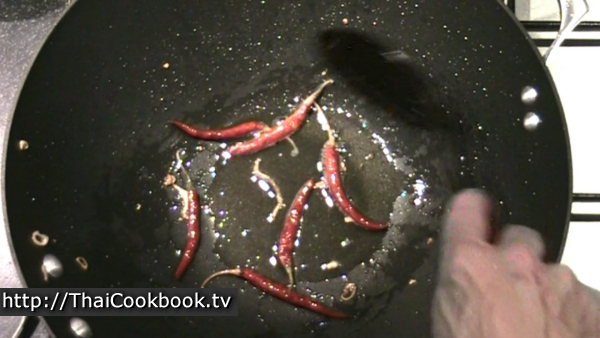 3) Fry the shallot and chilies in the remaining oil. 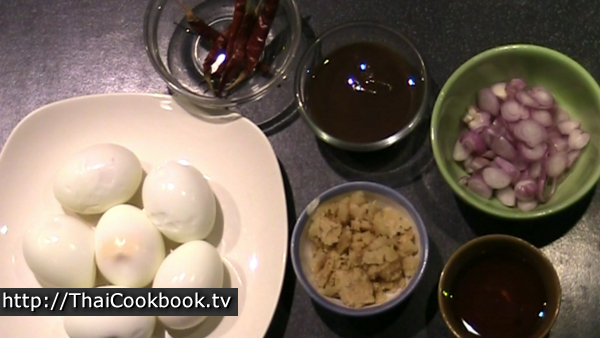 4) Cook the sugar, tamarind pulp and fish sauce to make the sweet and sour sauce. 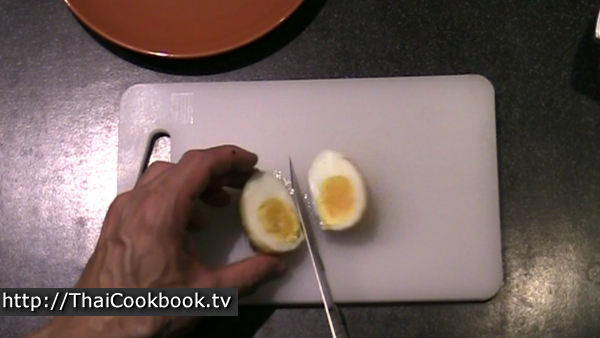 Boil the eggs and peel them when cooled. Peel and slice the shallots very thin, enough so you get about 1/2 - 3/4 cup of sliced shallots. Measure and get ready the other ingredients. Heat the oil in a wok over low flame. 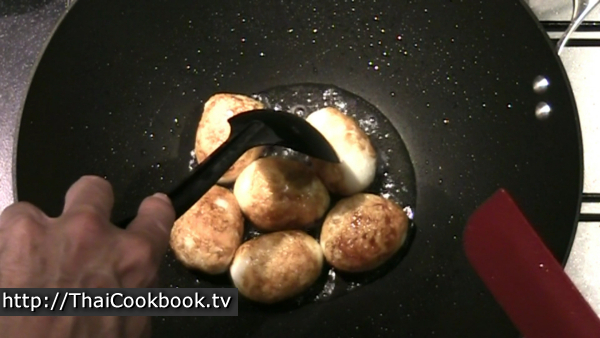 Dry the eggs with a paper towel if they are wet, then add them to the oil carefully. Fry them slowly on all sides until they are golden brown and crispy on the outside. 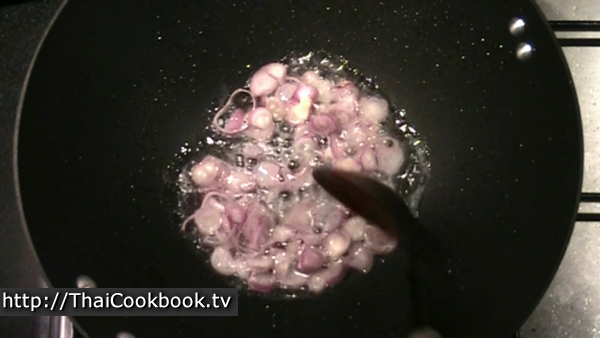 Fry the shallots in the oil left after frying the eggs until they are lightly browned. Remove from the pan immediately so they don't burn, and drain well. Next fry the dry chilies for about 30 seconds. Add the tamarind, sugar, and fish sauce to the remaining oil and stir in well until the sugar melts. Let it boil for about a minute until you have a rich and sticky sauce. 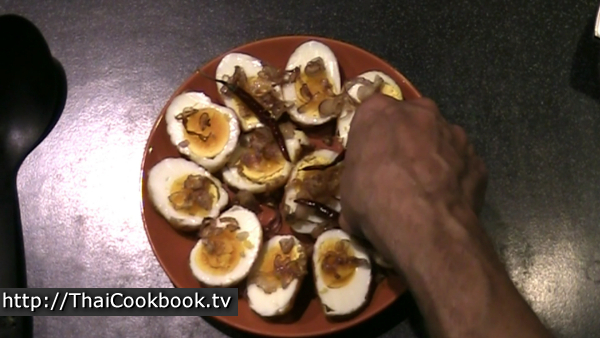 Cut the eggs in half lengthwise and arrange them open face on a plate. 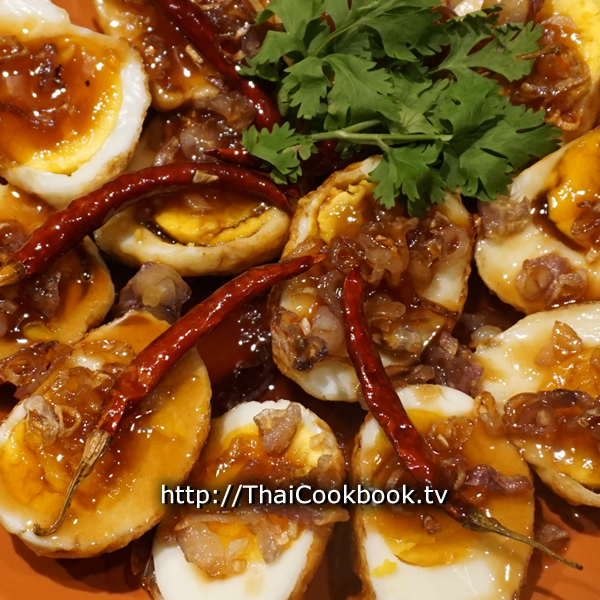 Sprinkle the fry shallots over each egg half, then arrange the chilies on top. Drizzle the sauce over everything, just enough to cover them partially. Save the sauce that's left over for something else. Serve at room temperature. Garnish with cilantro just before serving.